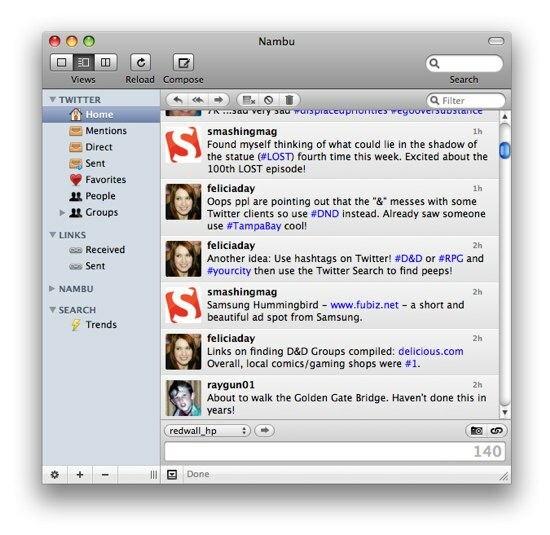 Nambu fits right into the Mac OS, being a native application rather than an Adobe AIR app. It took awhile for me to get used to it after using Twhirl for such a long time. It can display in three views. You can have it in sidebar mode, as it is pictured above, one-pane mode (like Twhirl), or in a multi-pane view like TweetDeck. Nambu let’s you manage multiple Twitter, Friendfeed, Ping.fm, and Identi.ca accounts easily. It can track those you are following through each account, and you can use a simple dropdown to chose which account to post a message to. The software integrates with Twitter Search well. You can call-up results by entering a term into the search box in the upper left, and the term will be added to your watch list. Nambu will continue to check it periodically, and notify you as new tweets show up. This is a useful feature that I may end up using in the near future to track topics of interest, so I can keep an eye on what people are talking about in areas that Webmaster-Source covers. Tr.im and Pic.im are tightly integrated with Nambu, being from the same developer. I was a little disappointed when I found out that Nambu wouldn’t let me use Is.gd, Bit.ly and TwitPic from the client. Tr.im is a good enough URL shortener, and is just as short as Is.gd, but I miss Twhirl’s convenient TwitPic integration. URL shortening is fairly intuitive. You paste an address into the input box, press the Shorten URLs button, and it gets Tr.im’d. Nambu also expands shortened URLs of all types when you’re viewing Tweets, changing the text of a TinyURL or Bit.ly link into the domain it points to. A word bubble with more information appears when you mouse over a link. 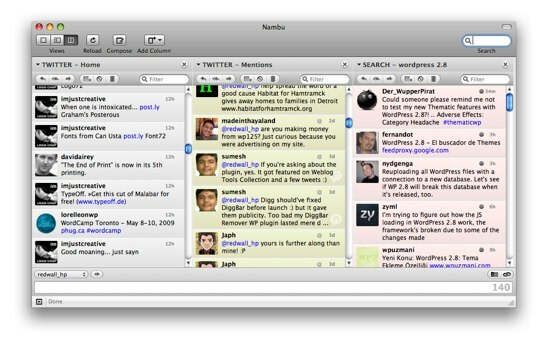 Nambu is a very nice desktop client for Twitter, and worth checking out if you run Mac OS X, or are considering purchasing a Mac.